The Solar Dynamics Observatory captured this image of an M1.2 class flare on June 13, 2012. The sun is shown here in teal as this is the color typically used to represent light in the 131 Angstrom wavelength, a wavelength particularly good for observing flares. An active sunspot is amping up the sun's activity, and has already unleashed two strong solar flares that triggered weekend geomagnetic storms on Earth, NASA officials say. The M-class solar flares set off two coronal mass ejections (CMEs) that erupted from the sun on last Wednesday and Thursday (June 13 and June 14). The first flare peaked Wednesday at 9:17 a.m. EDT (1317 GMT), and lasted for three hours, NASA scientists said. The resulting CME was hurled into space directly toward Earth, but was not expected to carry serious effects for the planet because it was traveling at a relatively slow speed. 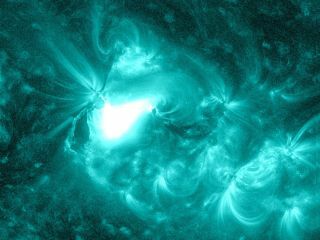 The second solar flare peaked on June 14 at 10:08 a.m. EDT (1408 GMT), and was also considered a long-duration event, agency officials said. NASA also released a video of the M-class solar flare on June 14 as it was observed by the sun-watching Solar Dynamics Observatory. Stunning northern lights were seen at lower latitudes than normal over the weekend, in some cases as low as Iowa, Nebraska and Maryland, NASA officials said. CMEs are clouds of plasma released by solar flares into space that are sometimes aimed directly at Earth. These ejections are made up of charged particles that, in severe cases, can damage satellites, endanger astronauts in orbit and interfere with power and communications infrastructure on Earth. The two solar flares originated from an active region on the sun that has been dubbed AR 1504. This hotspot of solar activity rotated to face Earth on the left side of the sun on June 10. No major interferences were reported from this weekend's geomagnetic storms, but AR 1504 still poses a threat, according to an update from the Space Weather Prediction Center, which is jointly managed by the National Oceanic and Atmospheric Administration and the National Weather Service. "The latest geomagnetic storm appears to be winding down, with the last period of G1 (Minor) activity coming late last night EDT," officials at the Space Weather Prediction Center said. "Solar Radiation Storm levels have returned to background levels after the small S1 (Minor) storm observed on June 16. No further activity is currently expected, but Region 1504 is still present and harbors a slight chance for subsequent activity." Active Region 1504 on the sun has been active since rotating into view. Image released June 14, 2012. X-class solar flares are the strongest type of solar eruptions, with M-class flares ranking as medium-strength, and C-class flares representing the weakest type. The sun's activity waxes and wanes on a roughly 11-year space weather cycle. The sun's current cycle, called Solar Cycle 24, began in 2008 and the star's activity is expected to ramp up toward a solar maximum in 2013. The Slooh Space Camera will be broadcasting a special live solar show on Wednesday (June 20) at 7 p.m. EDT (2300 GMT) to examine recent solar activity and to celebrate the summer solstice, the official start of summer in the Northern Hemisphere. Editor's note: If you snap any amazing aurora or sunspot photos that you'd like to be considered for use in a story or gallery, please send them to SPACE.com managing editor Tariq Malik at tmalik@space.com.